Gasteracantha cancriformis (Spinybacked Orbweaver) ♀. Size: approx. 8 mm. Photo: 08/28/11, noon. Other common names of Gasteracantha cancriformis include Crab Spider, Jewel Spider, and Smiley Face Spider. The six characteristic (spine-like) projections are often red and typically larger than in this specimen. 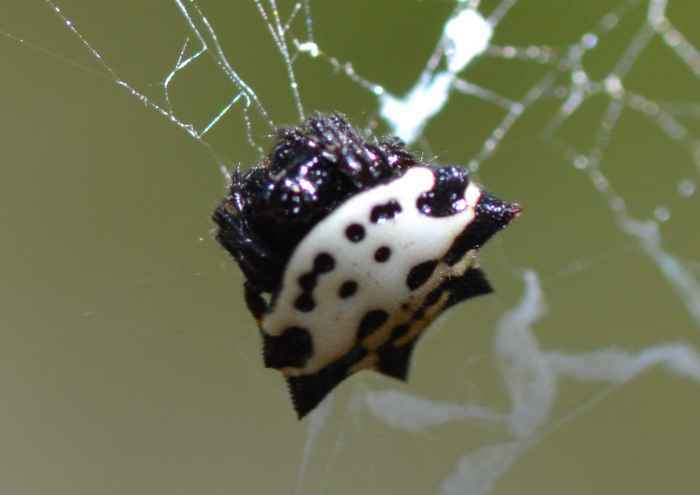 In Florida specimens, the dorsum is white with black spots; elsewhere the dorsum can also have other colors. They often live in or around trees and are most common in Fall. Their lifespan is short and ends with reproduction.